An article about food? Really? I know what you’re thinking, that there’s probably not much to write about. Make sure it’s tasty and throw it in the pack. But when you consider that food is the fuel that propels our body up that mountain, you start to realize that it is a crucial aspect of backpacking. In this article, I’ll give you some things to think about that might help you when deciding what food to pack, how much of it to bring, and when to eat it. The food we eat is literally the fuel source that makes our body function. I’m sure you’ve heard the term “calories” before. A calorie is the unit of energy used when talking about food. Calories are literally energy, and that’s all they are. A calorie isn’t a vitamin, it’s not a mineral, and it has no nutritional content. The calories in our food come from three sources: carbohydrates (also called sugars), proteins, and fats. Carbohydrates and proteins provide us with 4 calories per gram. Fats provide us with 9 calories per gram. What this means is that fats are much more energy-rich, or energy-dense, than carbohydrates or proteins. This concept of energy density, or “caloric density” is very important, as you’ll soon see. Just like getting a car from point A to point B takes a specific amount of energy (provided by gas), your body requires a specific amount of energy to get from point A to point B. Using some physics and math, we could actually calculate how much energy it would take to get you, a 150 pound hiker with a 15 pound backpack, from the trailhead of Mount Whitney at 8,360 feet, to the summit at 14,494 feet. Because my physics days are behind me, I’ll skip the math and venture a reasonable estimate of 1800 calories required for this feat. If you only packed carbohydrates or proteins, this would require 450 grams of food (1800 calories / 4 calories per gram), which works out to be 1 pound of food. However, if you read this article, you would know that fats are more energy dense, and you would have packed those instead. This means you would only need 200 grams of food (1800 calories / 9 calories per gram), which is only 0.44 pounds. Just by changing your fuel source, or the type of food you packed, in this situation you could cut your weight from 1 pound of food to under 1/2 a pound of food, and still get the same job done! Amazing, but true! If you are headed out for a day hike or an overnighter, you can probably just forget all of this “caloric density” business. The weight of your food is going to be negligible when compared to the rest of your gear. But once you start packing food for multiple days of backpacking, the weight and bulk can really start to add up. In addition, if you are the kind of hiker that likes to put in high-mile days, this section is for you! The harder and longer you hike each day, the more energy your body requires. 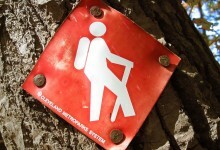 This means that you will have to pack more food (and more weight) than the leisurely hiker. To figure out what food is best to bring on a multi-day backpacking trip, calculate each food’s caloric density, or its calorie-to-ounce ratio. As I showed above, bringing a day’s worth of energy as fat is much better weight-wise than bringing a day’s worth of energy as carbs or proteins. Now obviously you aren’t just going to throw a few sticks of butter (almost pure fat) into your pack and call it good (although this would be the best “bang for your buck” in terms of weight and calories). In addition, most foods are comprised of some carbs, some fats, and some proteins. So the best way to go about finding out which foods you should bring is to calculate each food’s calorie-to-ounce ratio, or its caloric density. This sounds complicated, but it’s really quite easy. Nothing beyond the basic math skills you learned in elementary school are required – I promise. Lets compare a PowerBar and a Reese’s Peanut Butter Cup. A PowerBar Performance Oatmeal Raisin energy bar has 230 calories. It weighs 65 grams, or 2.3 ounces. Therefore, its caloric density is 100 (230 calories / 2.3 oz). A Reese’s Peanut Butter Cup weighs 0.25 ounces and has 36 calories, giving a caloric density of 144 (36 calories / 0.25 ounces). If I’m going on a trip where my food weight is going to add up, you’d better believe I’m choosing the Reese’s. How Much Food Should I Bring Backpacking? Unlike a car, when our bodies run out of fuel, they start using the “reserve tank.” Typically this reserve fuel will come from the fat from our “guts and butts.” I am a skinny, skinny guy, which means I really don’t have much of a reserve tank. If my body runs out of fuel, it won’t be long before it starts eating up important things that I need, like muscle. Because of this, I try to replace 100% of the energy I burn while I hike. Before I leave on my trips, I typically label my food bags with the amount of calories inside each bag, and from past experience, I can tell you that for me personally, it is very hard, if not impossible, to eat 100% of what I burn. Keep in mind that while it may have only taken 1800 calories to get me up that mountain, I actually burned a lot more energy that day. Each person has something called a “Basal Metabolic Rate.” This is the energy needed to keep your body alive. Your heart needs energy to pump, the brain needs energy to keep those brain cells going, etc, etc. As a 26 year-old male who weighs 155 pounds and is 6’2″ tall, my Basal Metabolic Rate is approximately 1700 calories. If all I did was sit on the couch watching TV all day long, I would still burn 1700 calories! Add that to the 1800 calories I burned hiking up Mount Whitney, and I’ve burned 3,500 calories for the day! You can find quick and easy Basal Metabolic Calculators online, like Discovery Health’s, to help you estimate your own BMR. Let’s say I plan on eating some oatmeal for breakfast (a caloric density of 106), a ProBar for lunch (density of 123), some Swedish Fish and Reese’s Pieces for snacks (100 and 144), and some Ramen Noodles for dinner (125). Assuming we pack an equal weight of all of the above foods (which we probably wouldn’t), we have an average caloric density of 120. Since we need 3,500 calories for the day, we need to make sure we have packed 29 ounces (or 1.8 pounds) of food. That’s a lot of food! As I said before, it is very hard to eat 100% of what you burn. My appetite drops when I hike, and there is no way I could eat 1.8 pounds of food in one day. In reality, most of us will do just fine to dip into our “reserve tank” and lose a little weight while backpacking. For some of us, losing weight is exactly what we want! If that is you, calculating the amount of calories you bring and the amount of calories you burn is just as important. There are many resources online to help you calculate the calorie deficit you should aim for to safely loose weight. This can easily be transferred over to your backpacking trip. Healthy Fresh Foods Are A No-No! Did this header grab your attention? That’s right – I’m telling you that healthy fresh foods like fruits and vegetables are the wrong thing to bring on your backpacking trips. Let me explain why. If you are running a marathon, hoofing it up a mountain, or climbing a rock face, your body is primarily concerned with one thing: energy. Vitamins and minerals are all good and necessary, but your body doesn’t need those vitamins now. Those are long-term considerations. Those healthy foods (and a healthy lifestyle in general) are what you should have been eating for months in preparation for your hike. When climbing up that mountain, what your body needs now is pure, unadulterated energy. Look at the table on the right of the energy density, or caloric density, of certain healthy foods. Remember that Reese’s Peanut Butter Cup, with a caloric density of 144? These fruits and veggies don’t look too great anymore, do they? If we just say that fruits and veggies have an average caloric density of around 15, then for the above example of hiking up Mount Whitney, we’d need over 14 pounds of fruits and veggies. Unacceptable! One notable exception to my rule of “healthy foods are a no-no” would be nuts. 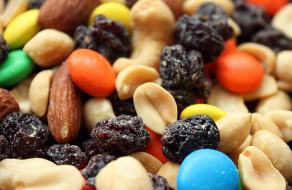 When eaten in moderation, nuts can be quite healthy. They are high in fats, but typically these are the “good” fats, such as unsaturated fats and Omega-3 fatty acids. They are also extremely high in protein. To the right is a sampling of the caloric densities of various nuts. As you can see, they have the highest caloric density of any foods you will find besides eating pure animal fat. Keep in mind that when I say healthy foods are bad, I am saying they are bad short-term performance foods. If you are a thru-hiker who will be on the trail for months at a time, or you spend every single weekend backpacking, you should be including foods with high nutritional content in your pack. But for those of you who get out on a weekend trip once every couple months (day hiking not included), skip the fruits and veggies and take some real performance foods. If you’re living a healthy lifestyle on a day-to-day basis, chowing down on junk food on your trip won’t have an adverse effect on your health. What About a “Sugar Crash”? Sugars, or carbohydrates, come in two main forms: simple carbohydrates and complex carbohydrates. 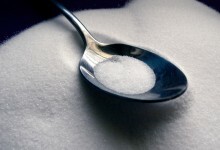 Simple carbohydrates are found in things like table sugar and candy bars. Simple carbs provide a quick boost of energy, but that energy level can drop off rapidly afterwards. This is what is often referred to as a “sugar crash.” Complex carbs are found in foods like whole grains, rice, and pasta. Complex carbs take longer to digest and as a result provide longer, more sustained energy. Complex carbs do not result in a sugar crash. For every day healthy living, complex carbs are by far the better choice. However, for backpacking, simple carbs have higher caloric densities, are typically more convenient to eat on the go, and usually don’t require any cooking. I often start out my backpacking day with oatmeal (a complex carb), and end it with something like Ramen Noodles (a complex carb). But throughout the day as I hike, the only foods I typically eat are simple carbs. So how do I avoid a sugar crash? The key to avoiding a sugar crash is to eat small amounts all throughout the day. Andrew Skurka, a long-distance backpacker with over 30,000 miles under his belt, calls this the “calorie-drip method.” The idea, if I may use his analogy, is to have a constant “IV drip” of calories slowly but steadily entering your system. This avoids the quick spike in energy and the sudden drop afterwards if you were to binge on candy at noon and not eat again until dinner. Instead of eating a traditional lunch, it is much better to slowly snack away all throughout the day. I am usually seen on the trail with a zip lock back in hand, slowly popping Peanut M&M’s or Swedish Fish as I go. Taking a long lunch break not only sets you up for a potential sugar crash, but also causes your heart rate to return to normal, making it harder to get going again after lunch. Try to avoid foods that contain water. Although water is a necessity (see our All About: Water Treatment article), it provides zero calories, and is something that can be acquired day by day as you fill up at streams. There is no reason to carry the extra bulk and weight when Mother Nature provides the water along the way. Foods that have low caloric densities most likely contain a lot of water, as is illustrated by the fresh fruits and vegetables above. If possible, bring the dehydrated or freeze-dried versions of foods, and use the water on the trail to reconstitute these foods. For example, instead of bringing MRE meals, bring some freeze-dried Mountain House meals, or dehydrate your own foods at home. 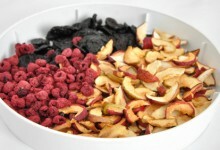 Dehydrated apple slices are a tasty snack while on the trail. Now that the water-weight is gone, the apple went from a caloric density of 14 to a density of 98! 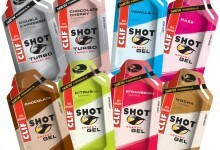 What About Fancy “Performance” Bars and Gels? Do these things really work? Yes! Do nuts, candy bars, and Swedish fish work? Yes! So what’s up with all of these products? What these products attempt to do is put together the perfect blend of ingredients to ensure that you body can perform at its best. I keep saying that energy is king, and that’s all you should be focusing on. In reality, your body is a complex machine, and there is much more going on inside than just energy utilization. Acids need to be buffered, calcium needs to be replenished, muscles need to be rebuilt. The best thing you can do to help your body run more efficiently and recover more quickly is to exercise on a regular basis. Assuming you have a healthy, balanced diet (we’re talking day-to-day diet here, not your weekend backpacking food), your body will have everything it needs to regulate its own environment. But what if I already do eat healthy and exercise regularly? Will these expensive performance foods take me even further? Maybe. Maybe not. The company’s product information might state that “ingredient x results in a 20% increase in y.” While this might look good on paper, does that increase actually result in any noticeable performance increase? Was the study done in a petri dish in a biology lab? If so, what are the real world implications, if any, for me on my backpacking trip? Keep in mind that the people making these performance bars and gels have a strong financial incentive. Most of the studies done on these products are conducted or financed by the company itself. This results in an obvious conflict of interest. My point with all of this is to take a balanced approach. If you have the money, and the fancy performance foods taste good to you, go for it! I’ve tried the gels, and they just didn’t taste that great to me. Anecdotally, I have noticed zero performance improvement with them over my normal backpacking food. However, I absolutely love the taste of ProBars, and while they are expensive, it only takes one bar to fill me up. I typically bring a few of these on every trip. Not because I believe they will give me magical powers, but because they are convenient, taste great, and are an entire meal wrapped up in one bar (I promise ProBar paid me nothing for this endorsement). If you’ve made it this far, you might be wondering if everything I have just talked about is really necessary. To be honest, for many of us, it probably isn’t. If anything, I hope I’ve given you some interesting information you didn’t know before. But if you’re interested in any and all ways to cut pack weight, while still retaining functionality, this article is important. If you’re interested in putting in high-mile days, this article is important. And if you’re planning long-distance trips where emergency help could be a long ways off, the skills to be able to calculate the calories you’ll need and the foods that will best suit those needs are crucial. Note: Nothing in this article constitutes medical advice. Seek the advice of a physician, nutritionist, or other professional before beginning an exercise routine or going on a backpacking trip beyond your skill level. In other words, don’t be stupid, and use this advice at your own risk.